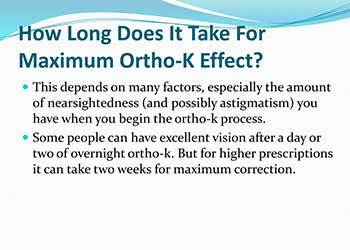 Home » What's New » How Long Does it Take to See Results with Ortho-K? How Long Does it Take to See Results with Ortho-K? Orthokeratology, commonly known as Ortho-K, is a treatment using custom contact lenses to reshape the cornea and is proven effective in correcting vision conditions like myopia, hyperopia, and astigmatism. The orthok contact lenses are worn overnight and help to correct refraction vision through gentle reshaping of the the surface of the eye. Typically, our patients will see an immediate improvement after one night of use. Expect maximum vision correction in about two weeks. The treatment temporarily reshapes the cornea, so without consistent use, the effects will wear off. Wearing the contact lenses every night will provide the best results. Initially, the contacts will take a little getting used to, but after a few nights, the contacts will feel quite natural. The contacts lenses can last for over a year with proper care, however, we may improve the prescription with our patients over time. Texas State Optical North Spring specializes is Ortho-K contacts and custom corneal topography measurements to ensure the best fit and effective results. Please contact us to schedule an appointment today.